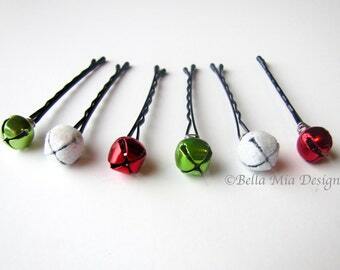 Holiday bells for your hair! 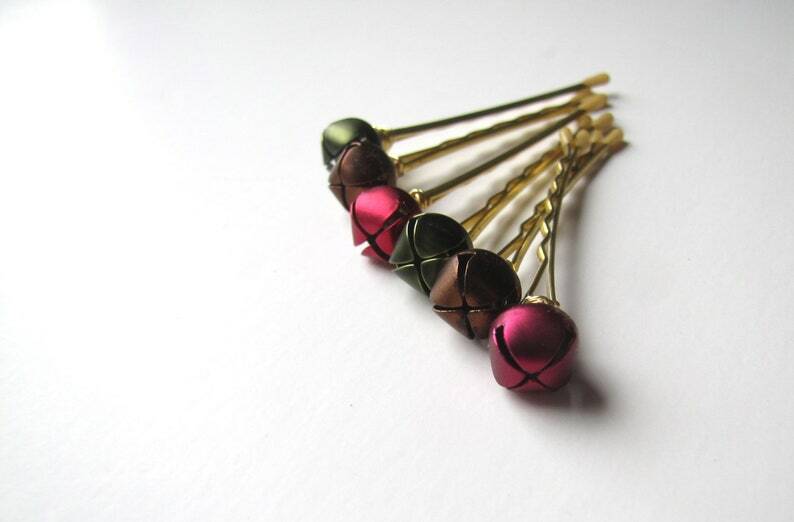 Fabulously fun set of 6 hair pins featuring burgundy red, green, and brown jingle bells to add to your hairstyle for your holiday celebrations. 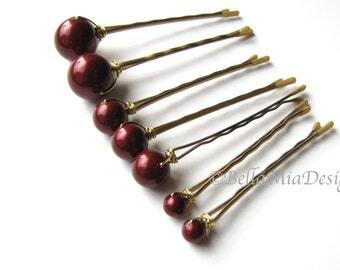 Each bell is attached to a gripping 2 inch gold tone bobby pin (customization available). Lovely wire wrapped style using gold tone wire. These small bells have just a subtle jingle to them. Keep away from children - choking hazard! WA State orders will have sales tax added during checkout. These shipped so quick and I'm so excited to have them in my hair for my wedding! She even writes you a sweet personal note :) Thank you! just as pictured or even more beautiful in hand. ~Contact me within 7 days of delivery of your item. ~After we've discussed the return, mail complete item back to me in original unworn condition. ~Reimbursement will be issued when I receive the item back in original condition. ~Shipping fees will not be refunded - only the item price, unless the item was misrepresented by an error on my part. DESTINATION: Make sure your address is correct. If sending as a gift to someone else, please make it clear where it is to be shipped to in the notes to seller or a message. METHOD: USPS First Class mail. Delivery confirmation included to US destinations. Need it expedited? Contact me BEFORE PURCHASE to get upgrade options/costs. INTERNATIONAL: YOU ARE RESPONSIBLE FOR ANY ADDITIONAL FEES (DUTIES, IMPORT, VAT, ETC.) While I mail orders promptly, once I mail your order, it is then in the hands of the postal service. International orders **USUALLY** arrive within 1.5 -3 weeks. However, some orders have TAKEN UP TO 6 WEEKS to arrive, depending on location and the customs dept. Please keep this in mind when ordering, as I cannot guarantee an arrival date. NOTE: Marking an order as a "Gift" means your invoice in the package will not have the $ amt listed. The recipient will STILL BE RESPONSIBLE FOR ANY IMPORT FEES, as I am required by law to declare the value on the customs form. UPGRADES: If you need your items expedited, please contact me PRIOR TO checkout so I can adjust the shipping rate. **CUSTOM ORDER? I love to make custom orders! Please send me a message. Whether you need mulitples for your wedding party, or just a different size or fastener of one of my creations, I will be happy to work with you. (Some of my items have limited materials and may not be available for multiples) Please be aware that if you need an exact match, the only way I can be most accuarate is to have a color sample sent to me, as the colors on the monitor may not be exact. **WHAT TO EXPECT WHEN YOU ORDER: I will send you a message within 24 hours of payment to let you know when your item will be shipped, and any other pertinent info. Orders to U.S. destinations will also receive a delivery confirmation/tracking number. I am always happy to answer questions, so feel free to contact me about your order.